It’s time, once again, to take stock of your accomplishments. Did you meet all of your goals for the year? Did you finish that book, send twenty query letters to magazines each month or start working on your memoirs? If so, congratulations! Keep up the good work. If not, you aren’t alone. Millions of people break their New Year’s resolutions and this is generally because they set their standards too high. Perhaps you can achieve success by lowering your sights. You have a very good chance of failure if you resolve to write a best seller, double your income and earn the Pulitzer Prize by year’s end. If you’ve never put pen to paper, perhaps a more realistic goal would be to spend three hours each day writing, enroll in a writing class and subscribe to a couple of writing publications. And then be willing to step outside your comfort zone. It’s like the woman who asked me to help her get over a serious writing slump. She hadn’t been able to write a meaningful word in months. She said that she wanted to get back to her poetry and short story writing, yet she wasn’t willing to make the necessary lifestyle changes. I suggested that she write for at least ten minutes each day in her journal. She saw no point in doing that when she really wanted to write poetry. I said, "Then write poetry for ten minutes each day." She replied, "I can’t do that. I told you I’m in a slump." I advised her to spend those ten minutes just sitting quietly or walking in a lovely setting. I said that if she did this each day, she would soon become inspired and she would start using this time to write. She said that was impossible—she had no time during the day to be quiet and by evening, her mind raced so fast, she could not get into a relaxed state. Obviously, until this woman is ready to make some changes, she will continue to fail. Are you going to spend the rest of your life watching others enjoy the lifestyle you desire or are you going to make this the year to claim success for yourself? 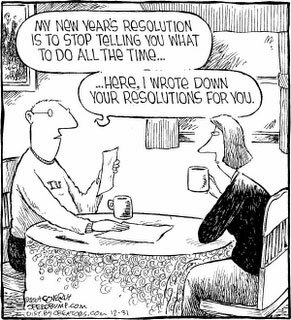 Here are some typical writers’ resolutions and some plans to help you get started on an adventure toward meeting your personal and professional goals. 1. Finish that book (poem, article, story). Pick up your work-in-progress now, while the year is new and you still have that great sense of starting fresh. But don’t look at this as one humungous project because you’ll feel overwhelmed. Take baby steps. Tackle this one page, one stanza, one paragraph at a time. Break it down into phases. For a book, you might vow to write a chapter each month. For a story, start with the outline, develop the characters, research the time period and then start the writing. These tasks might be scheduled over a period of a week or, if working on it only part-time, a month or two. 2. Start a writing project that you’ve wanted to pursue. Similar to the steps in the first resolution, figure out how much time it will take, how much time you want to devote per day/week and just start. One thing is for sure, if you don’t start it, you will never finish it. Make this the year you stop procrastinating. If you have several projects and don’t know which one to work on, use the list method. List the pros and the cons of starting each project at this time. The right one will become evident in your list. 3. Try one new book promotion idea per month. If you’re an author, you already know that there’s more to selling a book than having it in Barnes and Noble. Read my book, "Over 75 Good Ideas for Promoting Your Book" and John Kremer’s book featuring 1001 book promotion ideas and apply some of these ideas to your promotional repertoire this year. Arrange to sell your book through local independent bookstores and gift shops. Send press releases with order forms to libraries throughout the U.S. Record your book on tape for the blind and the busy. Do some piggyback marketing. I once procured a booth at the county fair to promote my local history book. Of course, I sold scads more than if I’d stayed home that week. 4. Approach at least one new market for your writing each month. Expand your horizons. If you typically write how-to pieces for parenting, general and health magazines, try your hand at a profile piece for a business publication, for example. Maybe you design brochures for local businesses. Increase your business and your expertise by offering to write their company newsletters. I know a writer who was earning a steady income writing PR material for a large healthcare firm. Last year, she decided to try something different and she has since sold three personal essays to a major woman’s magazine for a total sum of $4,000. 5. Write something different. As professional writers, we sometimes neglect our creative urges. We are so busy writing articles, working on clients’ books or writing company materials that we don’t get around to satisfying our own writing cravings. This year, reward yourself more. Set aside an hour a day or an entire afternoon each week to write poetry, work on your novel, or do more journaling. 6. Join a community or online writers’ group. My career accelerated when I finally left my writing cubicle and began connecting with other writers. I found the camaraderie and the support extremely nurturing and still do. I can’t even calculate the educational value. If you want to reap the benefits of networking with other writers, start looking for a local or online organization. Be a loyal participant. Bring what you can to the meetings or to the discussions and share it in exchange for all that you will glean. 7. Add a new dimension to your lifestyle. If you are a full-time writer, you’re probably at the computer day in and day out. You enjoy your work immensely, but sometimes feel on the verge of burnout. This year, establish some pleasurable time away from your office. Do more reading. Get involved in something creative such as mosaic or scrapbooking. Start playing tennis. And then pursue this activity at least a couple of times a week. 8.Volunteer more. It feels good to reach out and help someone. And there are a lot of projects writers can do within the community. Here are a few: Volunteer for the after school homework help program at your local library. Offer to mentor a journalism student or adult who is just starting a writing career. Start a writing club. Volunteer to write the fundraising material for a charity. 9. Make a gift of your writing. There are numerous ways to give through your writing. Make your own Christmas and greeting cards. Personalized cards are always appreciated. Write one of your poems in calligraphy, frame it and give it to a friend or family member. Create a book of your short stories and have it bound at Kinkos or a print-on-demand company. Write a children’s story starring the children in your life and give it to them for their birthdays. Maybe you know someone who can add charming drawings or photographs. For Christmas, I gather all of my published articles for that year, put them in binders and wrap them up for my three daughters and my parents. I know they enjoy this unique gift because one year I didn’t get around to putting the articles together for them and, boy, did I hear about it. They enjoy seeing the versatility and scope of my work and to have this ongoing keepsake. Use some of these unique ways to help you keep your New Year’s resolutions. The result will be a happier more productive you throughout the coming year. It is very true, it is hard to set and keep up with your "New Year's Resolutions"
I know I have found this to be true, for oh so many years so much happens that we set aside our yearly goals and then don't look back at what we could have done differently to reach them.